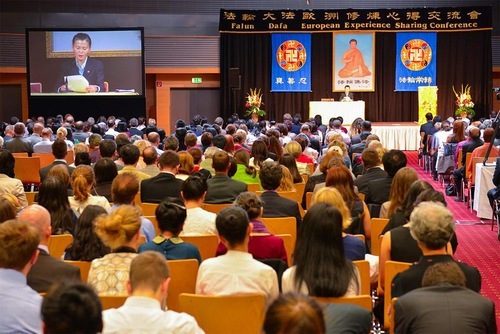 Falun Dafa practitioners from more than 30 European countries attended the 2015 European Cultivation Experience Sharing Conference on September 20 at the Austria Trend Eventhotel Pyramide in Vienna. Twenty-one practitioners from 13 European countries and the United States gave speeches. Reflecting the multicultural background of the attendees, the speeches were translated and read in seven languages, including Chinese, English, German, French, Spanish, Russian, and Italian. He shared a story. In 2002, Jiang Zemin, the Chinese Communist Party leader who initiated the suppression of Falun Dafa three years earlier, visited the European Union. Since there were no practitioners in Estonia and Lithuania, practitioners in Latvia decided to drive to these two countries and to hold protests. However, due to the pressure from China, some governments arrested practitioners who tried to approach Jiang in the protest. Almost every border agent had a blacklist of practitioners, provided by the Chinese government. Mr. Wang from Austria was confident and happy when he first started promoting Shen Yun last year. However, the ticket sales did not go as well as he expected. He started to complain about other practitioners for not working hard enough. When he tried harder to introduce Shen Yun to people, he found that people ignored him, and even tried to avoid him. The initial happiness was gone. When he corrected himself based on the Fa, collaborated with fellow practitioners well, and let go of self-interests, he sensed the happiness of cultivation once again. Sinikka from Finland said that cultivating as a coordinator made her stronger and more mature. “I learned how to prioritize others and do things based on the principle of cultivation,” she said. Seventy-three-year old Antoine from France had been tortured by the Togo government years ago before he was rescued. He said that his motivation for cultivating in Falun Dafa is to rescue the Chinese practitioners who are being persecuted in China. In the processes of clarifying the truth, Antoine has gotten rid of many notions and attachments, such as fear, pursuing fame and personal interests, and jealousy. “The more I go out to talk to people, the more attachments I am able to give up,” he said.